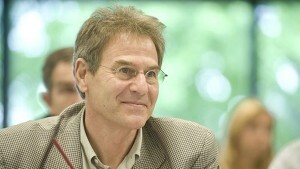 Charles Wyplosz (Vichy, 1957) is an economist known for his contributions in financial crises, European monetary integration, fiscal policy and regional monetary integration. He obtained his PhD in Economics in 1978 done at Harvard University. Currently he is working as professor of International Economics at the Graduate Institute in Geneva where he is Director of the International Centre for Money and Banking Studies. Previously he was the editor of the Economic Policy Journal and served as advisor to the governments of Russia, Cyprus and France as also to important institutions like the IMF, the World Bank, the European Commission and the European Parliament. He is also the co-author of two important textbooks: Macroeconomics: a European Text (with Michael C. Burda) and The Economics of European Integration (with Richard E. Baldwin).